A while back someone purchased The Lord’s Supper: Remembering and Proclaiming Christ Until He Comes for me from my Ministry Resource List, for which I am always grateful. I do a lot of reading, and had a number of books to get through before this one. I had requested the book because it came highly recommended as a great resource on the subject, but to be honest, I was not on-the-edge-of-my-seat-excited to read it. Like every other theologian, I am not equally interested in every theological topic, and the Lord’s Supper has never ranked too high on my list of theological priorities. I grew up Catholic. Communion was something we participated in weekly. I never understood what it was all about, and didn’t care to. It was just a ritual I went through (including the ritual of trying to get that sticky wafer off of the roof of my mouth with all sorts of clever tongue contortions). When I converted to Pentecostal, I went from celebrating the Lord’s Supper weekly to bi-annually or annually, so I had even less reason to give the topic much thought. Sure, I studied the various positions and the historical debates on the nature and purpose of the Supper in seminary. That piqued my interest a bit, but more from a historical perspective than a personal interest in my own practice of the Supper. 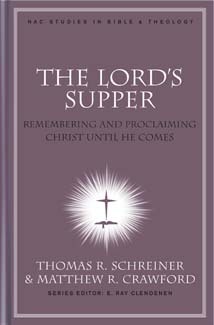 I saw the Supper as a memorial, through that we should do it (and more frequently than we usually do as Protestants), but never got much out of it personally. Then, I read this book. It has greatly enhanced my appreciation for the importance and significance of this ordinance instituted by none other than Jesus Himself. There are many nuances to the Supper that most of us pass over. This book draws them out.